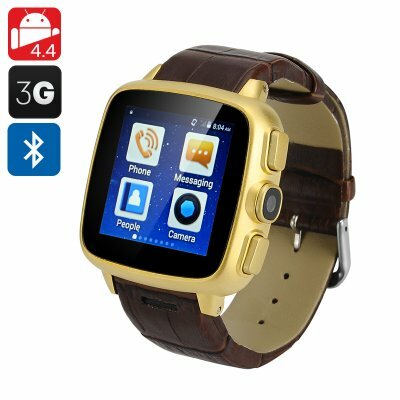 Successfully Added Ordro SW18 Cell Phone Watch - Android 4.4, 3G SIM Slot, Micro SD Support, 1.54 Inch Touch Screen, Bluetooth to your Shopping Cart. The Ordro SW18 is a standalone watch phone so it can do everything you need without being paired to a Smartphone, with 3G and 2G cellular network support you can make and take calls directly from your wrist. This smart watch runs an Android 4.4 OS and has access to the Google play store so you can add all manner of apps to keep you informed and updated with social media, news and sports results that are displayed well on the 1.54 inch color screen. With access to OK Google's voice commands you can make calls, dictate messages, find the best restaurants and browse the web, all by just talking to this smart watch. A built in 5MP camera will make you feel like a secret agent as you can snap photos discreetly or record video at 720p. The watches Bluetooth support means you can pair it with a Bluetooth headset or your car stereo for hands free call management. GPS support lends a hand with navigation making this phone a real winner for exploring new cities or the great outdoors as you will have a map on your wrist to guide you whenever required. With an IP67 waterproof rating the phone watch is able to withstand a downpour and can even be submersed in water. The Ordro SW18 has a 600mAh battery that brings an impressive 6 hours of talk time or as much as 72 hours in standby and with a USB powered magnetic charging doc there's no need to mess about when topping up the power. This Android Smart watch comes with a 12 months warranty, brought to you by the leader in electronic devices as well as wholesale watch phones..